V.com weekend vote: Do you play chamber music? March 9, 2018, 10:34 AM · "Chamber music keeps you honest." I can't remember who said it, but it rings true. When you play quartets, quintets and trios, for example, you have to hold your own. Why? One big reason is that there is only one person on each part. By contrast, in an orchestra section, other people also play the same parts, counting the same rests, filling in where one person might miss a note or have a mental lapse. There is some comfort in the section. But in a quartet or trio, every member must fully represent his or her part. There is no safety net, no one will save you if you mis-count! It's also just a lot of fun. I've had the great pleasure of playing in a reading quartet with group of colleagues over the past few years and alas! Our violist is moving out of town! It won't be the same. Finding a group of people who get along musically and personally is one of those treasures in life, whether the group has academic, professional, or amateur goals. One of my students is just getting started, playing in a quartet at school, and she asked me for some suggestions. I found myself saying, "There's a piece I think you'd all like by Mozart, 'Eine Kleine Nachtmusik'..." It almost seemed too obvious to suggest! Yet there is a reason it's so popular; it's a gem of a piece. And it's a tiny tip of the iceberg - the repertoire for chamber music is enormous, far-ranging and still growing. Do you play chamber music? What are your favorite pieces to play? How have you made the group dynamics work? Please participate in the vote and then share your experiences in the comments. March 9, 2018 at 05:59 PM · I participate in my music school's chamber music program and have participated for several years. All participants receive coaching from teachers and are placed into group based on instrumentation, availability and playing level. I would also like to do some chamber music with friends. I love playing chamber music to bits because it's fun. I've also done a few other short-term chamber things. March 9, 2018 at 06:28 PM · I am a member of South Bay Philharmonic, a community orchestra based in Silicon Valley. A subset of the orchestra started meeting as a string quartet a few years ago (I play the Violin1 part), and more recently we added another cello to make it a quintet. We usually meet for an hour right after our orchestra rehearsal, to work on repertoire. This past December, we performed the entire Schubert Quintet in C. Our next project, starting in about a week, will be Dvorak's Quintet No.3. We are all amateur musicians, so we do it for fun and there is no pressure. Good times! [Edit] Forgot to mention that one of our cellists also plays the Alto Violin (aka Vertical Viola), which is how we can pull off the Dvorak, which is scored for a viola quintet. March 9, 2018 at 06:36 PM · I haven't played in a chamber group but would like to I think. I do play in an informal Klezmer band, which might count, but I still replied as "never". March 9, 2018 at 07:18 PM · "I have in the past but don't now." Current schedule won't allow for it; but when the weather warms up, as it soon will here, and when I get past the typical first-quarter deluge of emergency rush jobs …? Hard to name a favorite -- so many pieces I really like. The above-mentioned Mozart was one of the first chamber pieces I played. I've also had fair doses of Haydn, Beethoven, Schumann, Brahms, Dvorak. I especially like having a piano in the ensemble -- e.g., the Schumann E-flat Quintet. This could be because piano was my first instrument, although I didn't get far with it, because the violin muse stole me quite early. Speaking of orchestra: I had the childhood ambition to become a symphony player; but by 21 y/o, I had changed my mind -- haven't done any more orchestra since then, because I had already found chamber-playing a lot more satisfying for my type of personality. Then, too, in chamber, I could actually hear myself think -- and hear myself play -- one player to a part. Still use earplugs, though, whatever I play -- although that's for another discussion. And I like that I really have to hold my own -- no safety net. About group dynamics: Would have to think about it a bit; but one thing is certain -- we are compatible and have chosen to work together. That's one big step forward in getting things done. In orchestra, or any big-group situation, there are bound to be a few characters you won't like -- but you can't get away from them. March 9, 2018 at 07:23 PM · 55 years a string quartet player and still counting (play on words intentional). As time goes on you learn to concentrate more and more on the music and less and less on your own playing. I think this is good! March 9, 2018 at 08:44 PM · I'm not sure how to answer the poll, because I play chamber music as often as I can, and go to summer chamber music workshops, but have never had a regular group I play with. Mostly I just get together with other musicians in impromptu groups once in a while to read. I was in my undergrad college's chamber music program, but as a pianist. So I could either say I play in multiple groups, or used to play (regularly) but don't any more. A partial list of favorite pieces I've played, on either viola or piano: Schubert "Death and the Maiden", Borodin String Quartet No. 2, Schumann Piano Quartet, Brahms Piano Quartet No. 3, Brahms Sextet No. 1, Dohnanyi Piano Quintet No. 1, Beach Theme and Variations for Flute and String Quartet, Brahms Horn Trio. I've been told I'm a natural section leader in orchestras because I play orchestral music as if it's chamber music: listening closely to others, breathing in time, large movements to signal entrances, and such. March 9, 2018 at 08:45 PM · "Finding a group of people who get along musically and personally is one of those treasures in life." I couldn't agree more and I'm happy to say I have found that with my string quartet. We recently added a flutist for certain pieces and it's even more fun! March 9, 2018 at 08:47 PM · I have been playing with various chamber groups as soon as I returned to violin in 2007 after a long hiatus. I also go to various chamber workshops whenever I can. Apart from trios, quartets, quintets, etc., I also learn a lot of chamber playing by working with pianist on my solo reps. To me, chamber music playing is like playing as a and with all other soloists because,as Laurie pointed out, you can't hide anything behind anyone. For this reason, I tend to prefer being prepared before playing with the group instead of just reading through a bunch of music, although being a good sight-reader has lot of advantages. I usually play violin 1 but I enjoy playing 2nd violin whenever I get the chance. While I love to play romantic reps,I'm always eager to work on quartets by Haydn, Mozart and early Beethoven. There are so much can be learned by working really carefully on these works. March 9, 2018 at 09:10 PM · I've never played chamber music, BUT to do so is by far my main motivation for taking up the viola. When I can get back to lessons and improve my standard (currently too poor to inflict myself on others) then seeking out others to play with will be one of my very first tasks. March 9, 2018 at 10:35 PM · Playing chamber music is my first love, followed closely by orchestral playing. I believe that playing chamber music is the fastest way to improve as a player, particularly for orchestral playing, and even more so if you aspire to play in a principal position. Learning to watch and listen to each other is a big part of it, along with having to absolutely master your own part. The negotiations with the other musicians about interpretation are incredibly valuable as well, in that we strive towards a better understanding of the score and also towards playing with intention. March 9, 2018 at 11:01 PM · I have been playing with a chamber ensemble for some months now. Last Saturday we had our public debut at a local church... it was amazing!! It is such a challenge, and more being the only strings (the other members are 2 flutes, a bassoon and a clarinet). Because of such strange group, we also have to make our own arrangements (one more challenge). For me the two keys to keep the group together are love for the music we are doing and commitment to the task of rehearse and build a program. March 9, 2018 at 11:05 PM · The closest I come to playing chamber is playing the duets in Doflein with my students. I had once tried to form a quartet many decades ago and learned, rather quickly, what the author of "The Ill Tempered String Quartet" was writing about. (Actually read the book some years later.) Laurie is "bang-on" when she notes that finding four musicians who can regularly play together is a "treasure." March 10, 2018 at 01:51 AM · As soon as I felt comfortable on the viola, I put together a quartet. I've known the two violinists since our sons were in kindergarten together, 20+ years ago. We meet every week and are in our 3rd year. It's quite a commitment but very enriching. A few weeks ago we got together with a harpsichordist and we plan to add music to our repertoire that she can join us with more often. I haven't yet done any chamber music workshops but I'm committed to a week-long 8 hr/day workshop this summer. March 10, 2018 at 01:53 AM · I grew up with chamber music and dad put me in where he could. At uni I performed a few times, including the 1st two movements of the Brahms D minor, which gained me a weekly sherry with a well-known author for the next two years, and the whole of the Brahms A-major with a blind pianist who had memorised from Braille. He was superb, it was a real privilege to play with him. He also introduced me to the Schubert A-minor Sonatina, which my father later adapted for his Easy Concerto series (Bosworth). Played and performed with larger assemblies as well. Over the years I've performed in violin/viola and piano duets (mainly sonatas, but also 4 of the Romanian Dances, and, most recently, as background music to entertain volunteers working in the rain at Alexandra Palace Railway Station, the Bach A minor concerto - I wasn't able to lay hands on my Bach E-major Sonata, which I would have preferred to play). I've also had the privilege of twice performing the two Brahms contralto-viola-piano songs. Plenty of trios, quartets, quintets, etc when dad was alive. I intend to be at one of my brother's scratch chamber music evenings soon (His house has four rooms in which chamber music can be played & he invites friends from his various orchestras - anyone reading this who feels like a chamber music session in central London Monday fortnight, please let me know, we might be able to fit you in), probably playing viola most of the time if not all of the time. March 10, 2018 at 03:53 AM · I'm a violist in the South Bay Philharmonic quintet that Gene Huang mentioned above :-) I met Gene first here on violinist.com, before I moved to California, so we can thank this site for connecting us to play chamber music. It was a real pleasure and honor to be able to play that piece for the first time! I also play violin with another quartet that I met through my daughter's viola teacher. And I play with a more informal reading group that doesn't perform, and occasionally with some other pick-up groups. I find that it's nice to be able to play violin or viola depending on what's needed. Before I moved to California, I played chamber music with some of my friends in the orchestra I was in in Massachusetts, the Arlington Philharmonic. We played at the Belmont Farmer's market every year and called ourselves the Mystic String Quartet and/or the Arlington Philharmonic Chamber Players, depending on who was playing. I also occasionally played with my kids. Playing chamber music is a nice way to meet people when you move to a new place, as well as a nice way to get to know people better within an orchestra. Looking forward to starting the Dvorak! March 10, 2018 at 07:04 AM · Karen, I love Schubert cello quintet so much! It's probably the best chamber music work there is. I played it with some very good players last week when I visited San Miguel de Allende, Mexico. I also love Dvorak. I performed "American" in a chamber music workshop in Tuscany two years ago.I was violin 1 and my husand played viola. Viola part is great. Our coach even suggested that viola was the one "controls" this piece. Have fun! March 10, 2018 at 11:34 AM · If you like Dvorak's chamber music (by and large, I prefer his more mature pre-American output to his American), you should try Smetana's "From My Life". March 10, 2018 at 11:48 AM · Those of you who are playing chamber music: where are you finding people to play with? I have loved playing chamber music in the past but am not having much luck these days. The last three attempts I've made to play chamber music with others who said they were interested, someone has failed to show up, cancelled last minute, or not responded to scheduling requests. Lauri--unfortunately I am in Atlanta rather than L.A. and can't fill in for your violist! March 10, 2018 at 12:21 PM · Isaac - I started viola as a retirement project, and am not very good; but I love playing chamber music, so I started a quartet with friends. 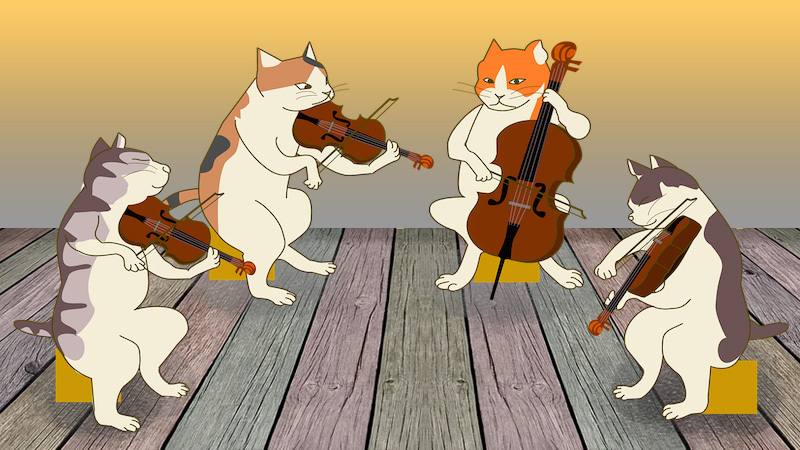 It's the violinists who seem to miss our weekly rehearsals, so I now have 2 more, though we still play quarts.. I started playing with others early on, in a very forgiving community orchestra. I also went to a free adult starters string class. We (the "quartet') mostly knew each other already, but it ws because of these 2 groups that we knew each other as string players. So maybe you could go the route of playing in larger groups first? Apologies if you've already done this. March 10, 2018 at 02:22 PM · Isaac, community orchstra(s), summer music camps/workshops, chamber music workshops and your teacher (if you have one) are some of the good places to find other players. It doesn't hurt to be a good player, as word gets around fast among amateur musicians and you are likely to be approached by others if you can play. March 10, 2018 at 04:03 PM · I play in an ensemble every day, sometimes two...quartets, quintets, trios, piano trios/qttes and our symphony. When I was really young, it was the best way for me to learn to sight-read and listen to the entire complexity of music. My current groups are fortunate to have abundant music gathered from those who came before us so we have unlimited resources. Each ensemble plays at least three works with each gathering....Bach to Brahms. There was a period in my life when I had "too much work" to play. I am making up for lost musical moments. March 10, 2018 at 05:21 PM · I'm in a local high school chamber music society that places high school students in chamber groups and pairs them with professional coaches. Last year I was in a string quartet, and this year I'm in a piano quartet through this program. I'm also in a string quartet with some of the other principals / assistant principals in my school orchestra. Chamber music definitely forced me to become a much better player - last year, the other members of my quartet had all been playing 6+ years to my 2 years of playing, and I had to make up for lost time and lacking technique in order to "hold my own" (went from struggling with the Bach Double last year to making it into all-state orchestra and working on the Kabalevsky Concerto this year, and I fully attribute that to chamber music). Quartets are by far my favorite ensemble to play in, as well. My piano quartet is working on the Schumann Piano Quartet in Eb right now, and it's possibly my favorite piece. My string quartet through school played a bunch of the Hampton String Quartet's Christmas arrangements in the style of Mozart for a gig at a holiday luncheon this December, which was also very fun. I'm not entirely sure how I'll manage to continue with chamber music in college while double-majoring in two fields unrelated to music, but I definitely want to do so. March 10, 2018 at 10:20 PM · I haven't played in a string quartet yet, but it's on my bucket list. March 11, 2018 at 03:15 AM · @Yixi, I love the Schubert cello quintet too. I didn't know what to expect when I started. I was a sub for the regular violist, who turned out to have other commitments, so I became the full-time violist. All the parts are good, and even if you don't take all the repeats, it's 50 minutes long. So it is really an endurance test on top of everything else. I think it is one of the highlights of my entire musical life so far. I will also say that I think I learned to be fluent in alto clef by playing viola chamber music. I have been playing viola a while now, more than 10 years, but when I first started I just played solo pieces--transcriptions of the Bach suites, viola concertos, solos for young violists, that type of thing. And I never got beyond a certain point with alto clef. It was always the poor brother of treble. Then I started playing the Schubert, and other chamber music, on the viola. I had to learn to read the clef quickly and easily, and finally did. It was good that my chamber music partners were patient! March 11, 2018 at 05:15 AM · Most recently I played in a quartet and we performed the last mvt of the American quartet for solo and ensemble competition. It was very fun. March 11, 2018 at 04:10 PM · I have played chamber music all my life, from the very first teacher who formed small groups of us to play together, then later, on my own and with other like-minded students. As a professional I had a quartet for several years while playing in a symphony orchestra and always made time for chamber music. After retiring I played chamber music in several groups. To even think of a favourite piece is impossible for me - too many wonderful works to choose from but the Beethoven quartets are special for me. March 12, 2018 at 12:14 PM · The American Quintet was indeed written in America after the Quartet, but after the first movement, it gets a bit more Czech. March 13, 2018 at 05:46 PM · I like to play both orchestral and chamber music, but recently I´ve been looking towards chamber. I´m now searching trying to convince some friends of mine to play some trios by Max Reger, I just love them!